Despite everyone’s obsession with avocado, I rarely see it cooked. Baked and grilled avocados are phenomenal – the warmed avocado meat is sensational. Really, sensational. Such a simple trick and so much yumminess. The avocado softens, becomes more fragrant and better complements the other ingredients. I once baked an egg in an avocado. THAT was incredible. 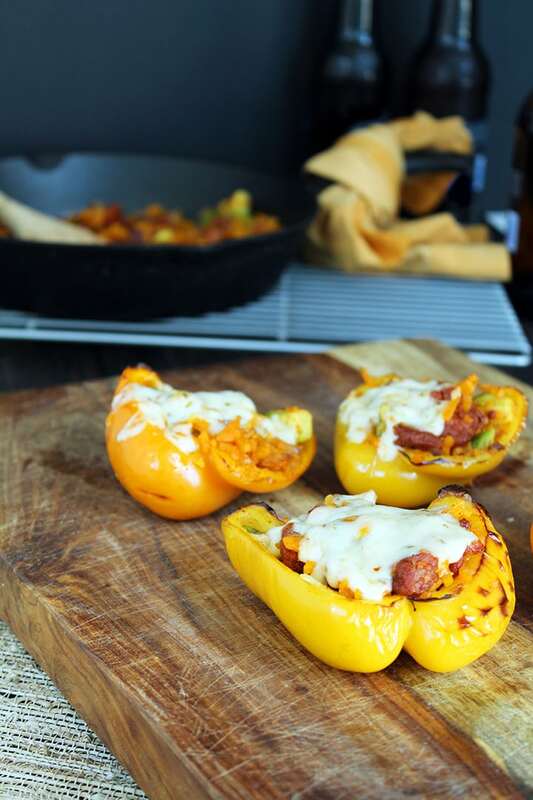 Now, we cook chorizo, avocado and my butternut squash rice together, stuff it into a bell pepper and melt pepper jack cheese on top. I can’t even tell you how good this tastes. I’m at a loss for words. I looked through the Thesaurus and there just isn’t a word for this. The rice absorbs the juices of the chorizo and the smoked paprika and cumin just, well, make your mouth water. 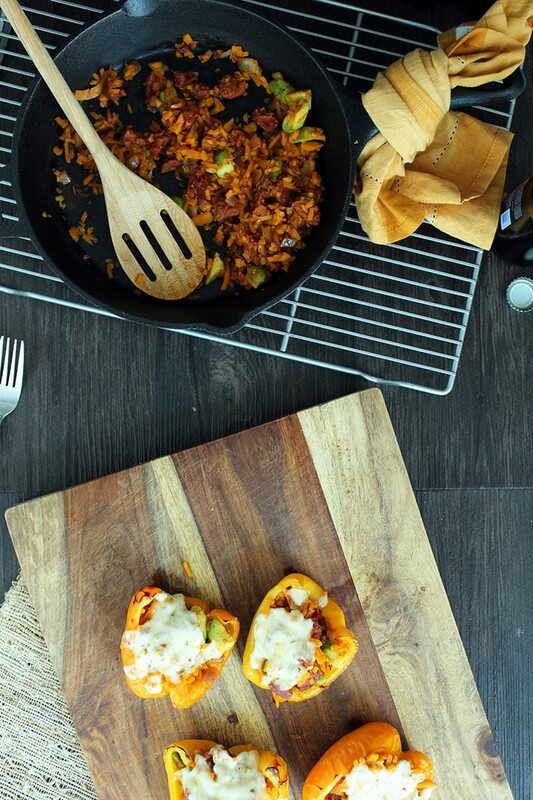 Instead of stuffing a pepper with rice or quinoa, use the butternut squash rice. When I tell you that this is the BEST food for your Superbowl party, I really mean it. 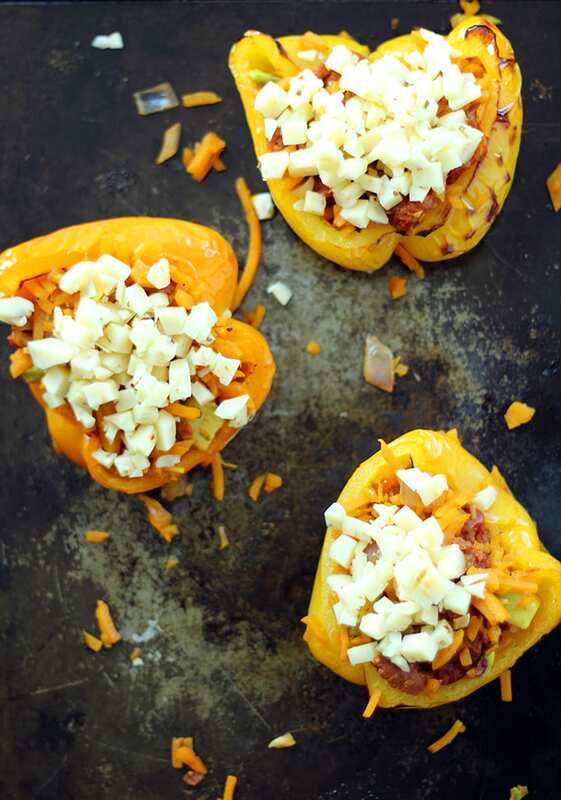 If you’d like to use it as an appetizer, use small bell peppers. 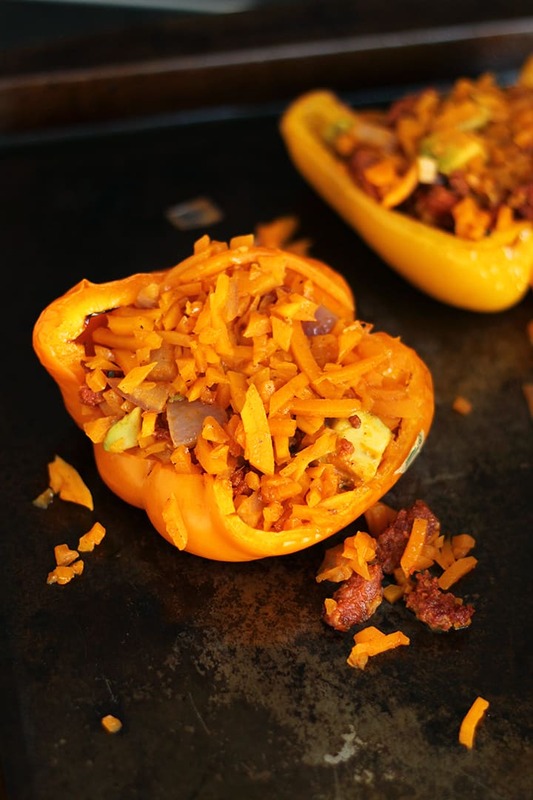 If you’re using it as a main dish, use larger bell peppers and serve the halves stuffed to the brim! And on purpose, you’ll have some leftovers with this recipe. The stuffing is so delicious, that it’s perfect for lunch the next day. Actually, I came home Friday night (after a night out with the girls) and was so excited to eat said leftovers, but I came to find that Lu had eaten them for dinner! Thankfully, he saved me an extra bell pepper. Which I devoured. 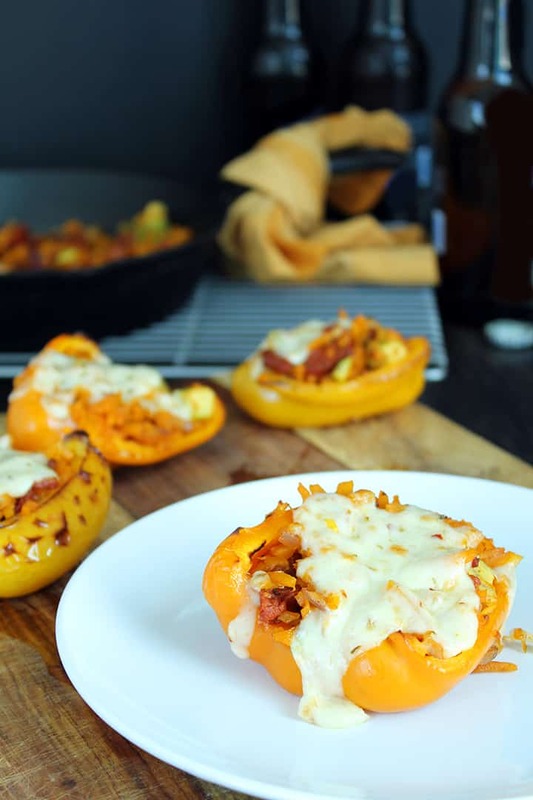 You’re going to love these for dinner, but they’re perfect as an impressive, healthy and super tasty Superbowl food. Have you tried the rice yet? What do you think? Preheat the oven to broil. 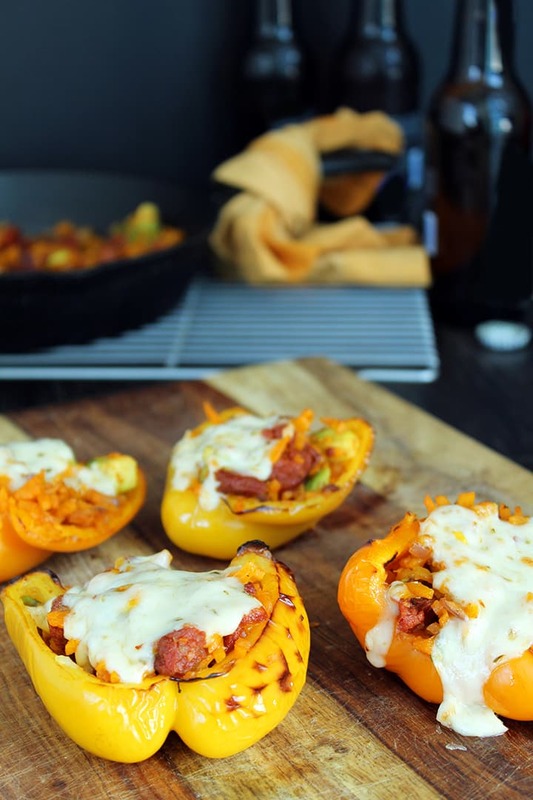 Slice the tops off your bell peppers, slice them in half lengthwise and then remove the white parts from the insides. 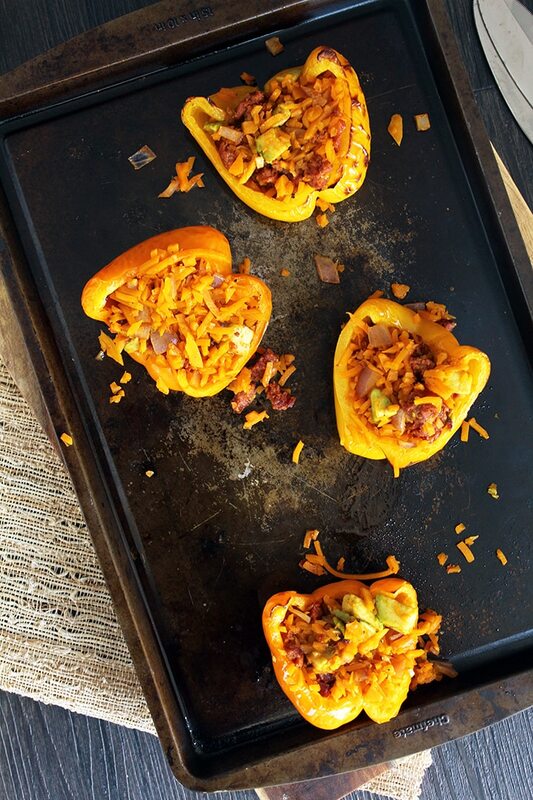 Once it's preheated, place them on a baking tray lightly coated in cooking spray. Broil for 4 minutes and the remove from the oven, but keep the oven on broil. 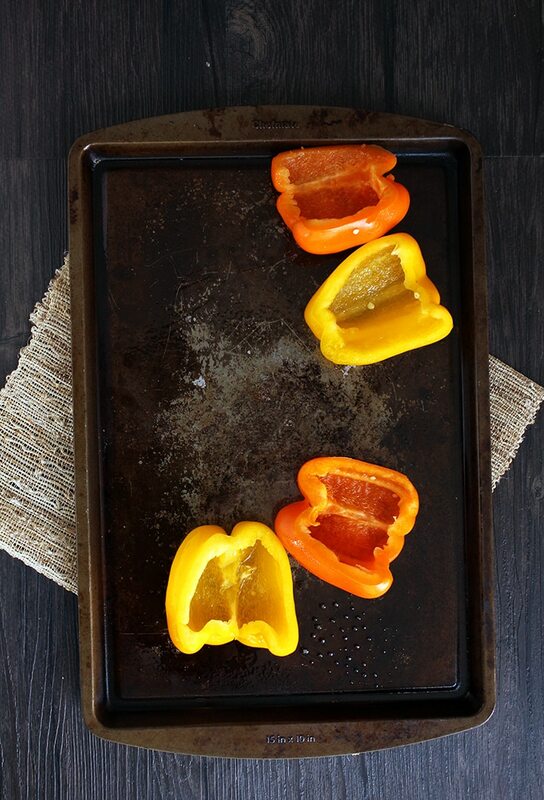 While the peppers are broiling, place a large skillet over medium-low heat and spray with cooking spray. Add in the chorizo and avocado and cook, tossing frequently for 3-5 minutes. Set aside and add in 1 tbsp olive oil, garlic, red pepper flakes and cook for 30 seconds. Then, add in the onion and cook for about 2 minutes or until onion beings to soften. Add in the butternut squash rice, salt, cumin and smoked paprika. Stir to combine and cook for 1 minute. Then, add in 1/2 cup chicken broth. Stir to combine and let reduce, stirring occasionally. Once reduced fully, add in 1/4 cup chicken broth and let reduce. Taste the rice and if the rice is still crunchy, add in another 1/4 cup of broth and let reduce. 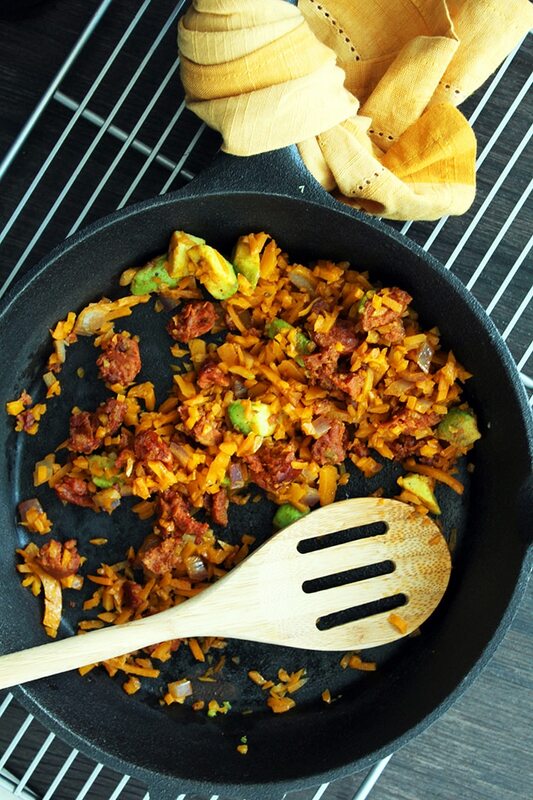 If the rice is done (the consistency is that of rice), add in the chorizo and avocado and stir to combine. Once the rice mixture is done, stuff the peppers with it, using a spoon. 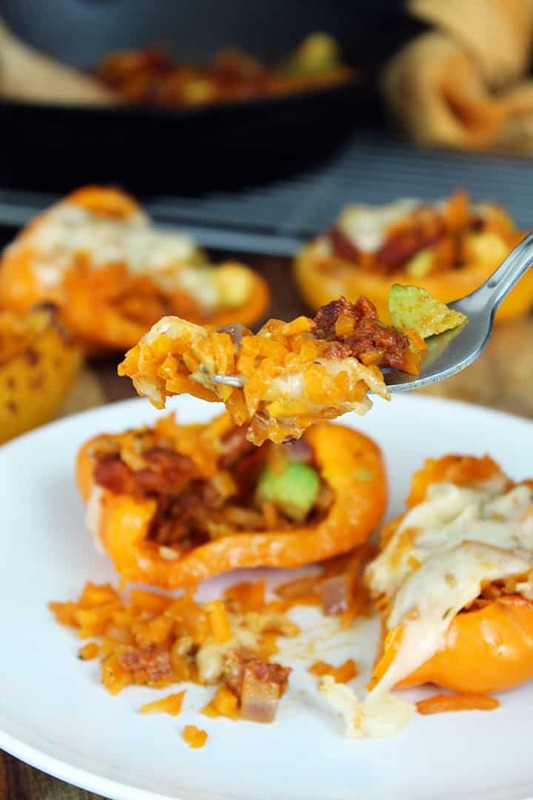 Pat down the tops of the stuffed peppers with the back of the spoon to compress. 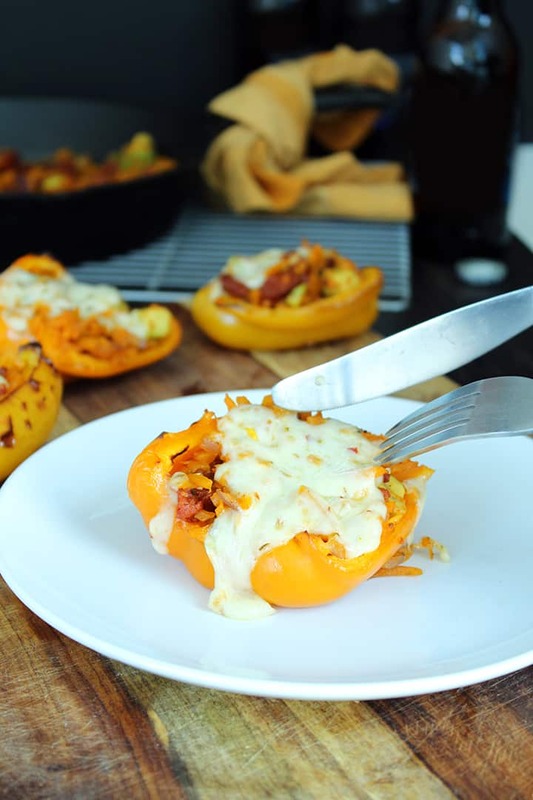 Top each pepper with the pepper jack cheese evenly and place in the broiler. Broil for about 3 minutes, checking after 2 minutes to make sure it does not burn. Once the cheese has melted, remove from the oven and serve! To make butternut squash rice, spiralize a butternut squash and then place the noodles into a food processor and pulse until made into rice-like bits. This will make 2 cups of rice (a 348g piece of butternut squash makes 2 cups). Thank YOU - I'm glad you like the recipe. I don't eat meat, think I could follow the recipe & just omit the sausage? Yes, definitely - try using pinto beans! I just bought my spiralizer for Christmas and so far have just made your caprese beet dinner which btw was amazing, the whole family loved! 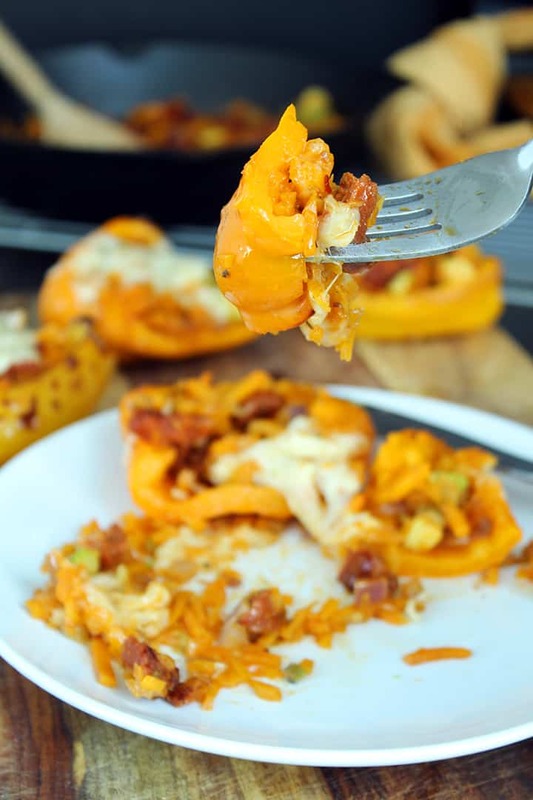 I need to try some of these recipes you're making using the riced butternut squash! but question. Can I make a big batch of the rice using a a whole squash and then freeze it into 2 cup portions so then I have it ready to go? Should I defrost before using the rice then or just toss in still frozen? Have you tried this yet and if not what are your thoughts? Thank you! Yes, you can definitely do that! You can freeze it or keep it in the fridge for up to 4 days! Definitely defrost the rice first before you put it in the pan. The frozen butternut squash rice worked perfectly! I made these 3 weeks ago & the whole family really loved them. I think it was the chorizo & creamy avocado that did it! I had never eaten cooked avocado before & was wondering if it would be good. We love avocado raw.. but cooked?? Well, question was laid to rest, it was so creamy & helped offset the strong taste of chorizo. The kids said they couldn't even taste the squash! So I riced a whole butternut squash & saved 1/2 of it in the freezer. Pulled it out a couple days ago & defrosted in fridge & then used it in the recipe again tonight. Perfect! Made it a really quick & easy dinner. And also another thanks for cooking avocado. I made a recipe a couple weeks ago that used avocado on a homemade pizza. Dice & top a pizza with avocado. It was so good....made you need less cheese as it was a creamy addition. Now love cooked avocado & will try & remember to try it on other things in place of cheese. Thank you for the inspirational recipe!YUM! What kind of chorizo are you buying for your recipes? How much avocado is used in the recipe? I don't see it listed. (Am I missing it?) This looks amazing! Oops, I'm sorry - thanks for checking. 1 full avocado, insides cubed! These were delicious! Didn't have Monterrey jack so used crumbled feta instead. Came out great! 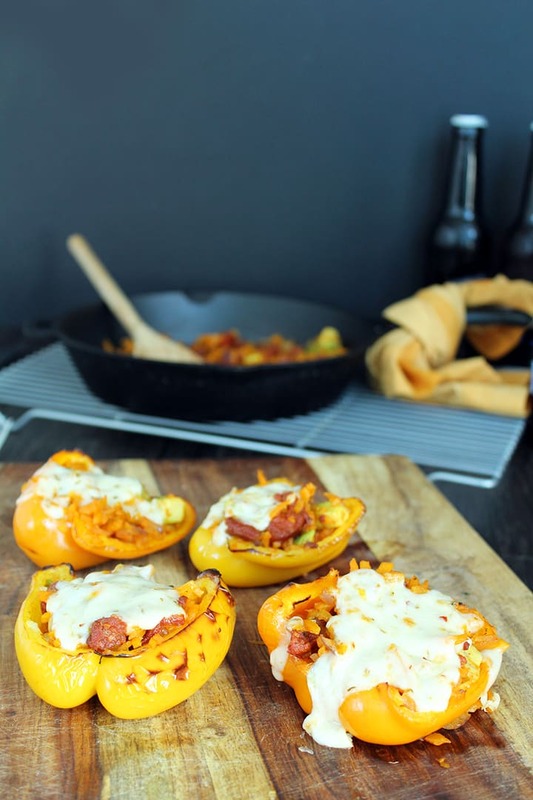 I'm so glad you gave these a try - these stuffed peppers are going to become a staple in my household! Yum, feta would be great! 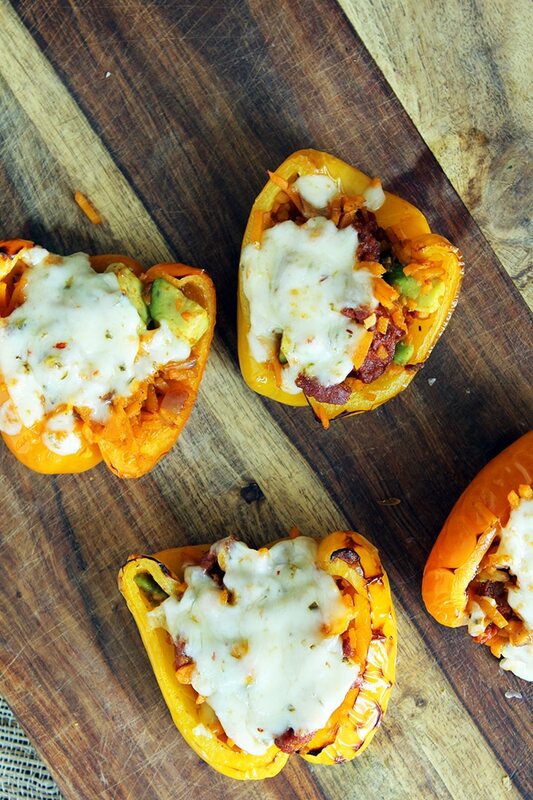 We would totally devour this for dinner! This was absolutely amazing!! My husband had no idea that I used a butternut squash as the base. SO so good! Thanks Jenny, so glad you liked it! Been so excited the whole week to have this for dinner tonight and it certainly did not disappoint!! 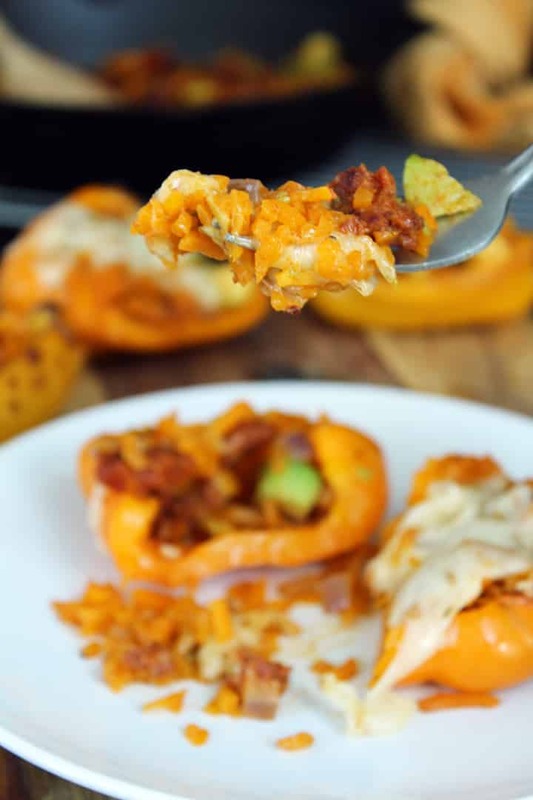 Absolutely delicious and felt like such a treat being able to eat all that yummy chorizo and avocado by using pumpkin instead of actual rice! So good! oooommmmggggg!!!!!!! firstly let me introduce myself. I am catherine and i am not a vegetable person at all. i think there are something you have to eat just because its good for you. I discovered your blog by accident from "Against all Grain" which i also discovered by accident all i can say is that you are amazingly talented. I've only been on your site for two days and I've never been so excited about vegetables in my entire life till now. this recipe was amazing,, served it to my friends they even had seconds. you are amazingly talented please keep up the good work and I'm really looking for to your book. I made this for dinner tonight....outstanding! I will be making this again! I have to tell you how much I LOVE your blog!!! I share it with everyone I know! EVERYTHING I have made, and I have made a lot of your recipes, has been AMAZING. I made this tonight and have to say, although I cooked too long and made it mushy, it was "to die for!" Thank you so much for all you do!! !